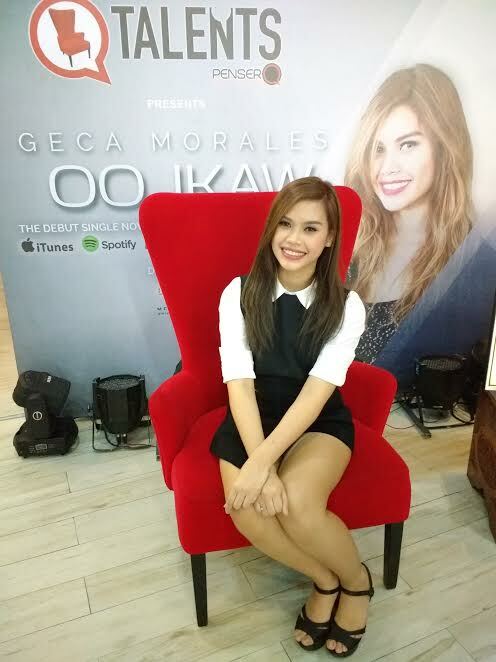 An ordinary girl that becomes the newest singer song writer Geca Morales released her debut single "Oo,Ikaw." She is the first artist of Penser Q who has smooth rapping skills and powerful rock rendition with confidence. Geca found a sense of peace and place singing the memorable hits of Kelly Clarkson, Katy Perry, Nicki Minaj and Mandy Moore, whom she greatly admired. She continued to hone her craft at the Center for Pop Musc Philippines, training under the best vocal coaches. In time, she found herself competing against her peers. She joined Center For Pop Music Philippines Voice Recording Excellence competition and won 1st runner up. Soon, Geca was invited to be part of the shool's prestigious roster of artists. Geca also paired up with other female vocalist at the center to form the girl group, Las Chicas. Over the next few years, Geca would prove to be unstoppable. She joined bigger and more prestigious competitions to challenge herself. She won the Outstanding Performer Award from GawaMusika in 2016. Then that same year, she was named Senior Solo Vocalist for Team Philippines at the World Championships of Performing Arts (WCOPA) held in California, US. WCOPA is the firat and only global "Talent Olypics," she won the Gold in the Female Vocal Rap Category, and the Silver Medal in the Female Vocal Rock Category. Today, Geca has not only found her voice, she is excited to share it with the rest of the world. Set on becoming a full fledged performer like her idols Sarah Geronimo and KZ Tandingan, Geca launched her first single, "OO,Ikaw" under MCA Music (Universal Musci Philippines) and her first music video. "My debut single was really an exciting experience. I had this song for the longest time," she revealed. "This song represented me and the music that I wanted to make so many years ago. Its a little alternative, a little light rock, but very truthful to who I am as an artist," Geca shared with a smile. For her first original song, Geca explores young love, the fear of rejection and taking risks. "I am already happy hearing my song on the radio, and seeing how people react to it. I'm overjoyed when people tell me how they've been touched by my music. I hope everyone gets the chance to listen to my single, and enjoy it as much as I do." Geca has indeed, found her voice and the world is now ready to listen.